While we work hard on each and every review and never recommend a product we don’t fully believe in, there are some products that we feel demand extra special attention in the review process. However, this is not because we are concerned about the product’s quality. We believe that some products—like chamois cream or skin lube—can have a significant impact on our readers (in this case, we really mean “significant discomfort”). So when we say that we’re fans of SBR’sTriSlide, trust that we recommend this product only after making sure we never had any uncomfortable situations! It’s not often that you’ll hear “chamois cream” and “innovative” in the same sentence, but SBR did something truly innovative with TriSlide. They produced it as an aerosol spray. This may sound like a small thing, but how many of you have had to apply chamois cream with ice-cold hands? Or how about dealing with a greasy mess on your hands? TriSlide allowed us to apply lubricant faster and more comfortably (no more icy hands!) than any chamois cream we had tried before! We tested TriSlide’s effectiveness for three different uses—cycling, running, and a sprint distance triathlon. While we typically test most products for around 30 days, we tested TriSlide for closer to a full 60-day period. As mentioned above, we didn’t want any of our readers to suffer any skin discomfort due to our mistakes, so we wanted to be absolutely sure of our results. 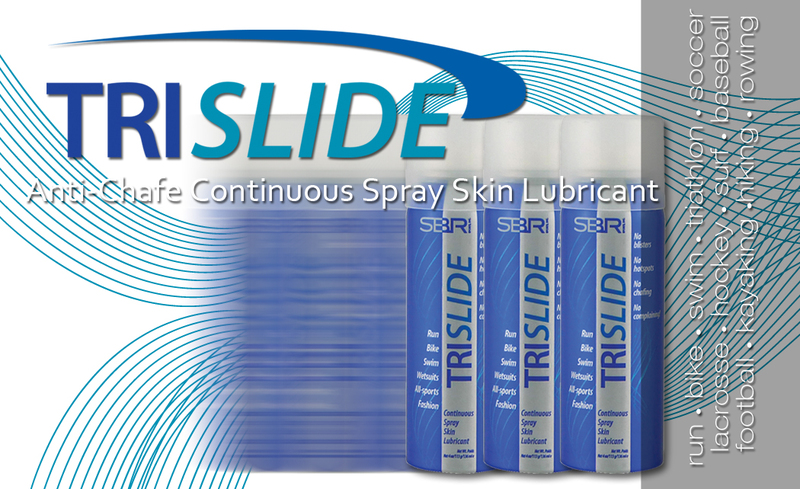 TriSlide is marketed as a full-body skin lube that can be used on the neck, under arms, inner thigh, and chest. It not only can be used as a chamois cream for cycling, but also as a lubricant for getting wetsuits on and off (according to SBR, its composition is safe with neoprene). Here in sunny south Florida our water temperatures are already higher than those you’d expect in March. So we did not have much of a chance to test it with a wet suit. Additionally, we limited most of our testing to those spots most commonly associated with cycling and running. For cycling we were typically doing 20-50 mile rides, while runs were 45 to 90 minutes. We’ve found was that TriSlide works as an excellent chamois cream in almost all scenarios. It tended to feel a bit wet when sprayed on, but the feeling immediately went away when clothing was placed on top of it. For the majority of rides, every run, and most importantly, through an 80 minute sprint (including an ocean swim), we never experienced any chafing. It worked exactly as advertised. The only time we experienced discomfort was just past the two-hour mark of a half-century ride. On these longer rides we found the cream tended to wear thin toward the end. TriSlide is exactly the kind of product we love here at AeroGeeks. SBR took a fairly common product and found a new way to improve upon it. A skin lube that works as advertised is always nice, but the fact that this particular lube comes in a can with a spray nozzle makes a world of difference. We highly recommend giving it try! I LOVE it! I use it for all 3 sports as well. So much better than having greasy hands!